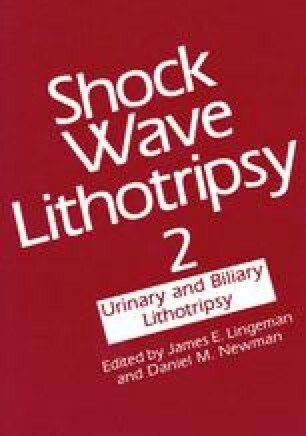 The majority of studies on extracorporeal shock wave lithotripsy (ESWL*) are “open” studies which systematically combine medical therapy with lithotripsy. Generally the medical therapy is begun before lithotripsy and then is continued for a variable amount of time post lithotripsy. As a consequence of this combination, it is impossible to determine the respective roles of lithotripsy and of medical therapy in the final results achieved. The best way to determine these respective roles is to begin by performing lithotripsy alone. Therefore, into this ESWL study a waiting period with no medical therapy was incorporated during which the degree of fragment elimination after lithotripsy was monitored. ESWL was not limited to one session. The goal of this prospective multi-center study, being carried out by surgeons from six different hospitals in Paris, was to determine the effectiveness of lithotripsy independent of medical therapy. Selection of patients was based on the following: patients had symptomatic gallstone disease, functional gallbladders, and one to five stones smaller than 30 mm in diameter. Stones could be radiolucent or calcified, and patients were required to give informed consent. Patients were excluded if they were unable to sustain a cholecystectomy or if a complication related to the stones had occurred. The patients were treated under minimal analgesia on the Sonolith 3000 using ultrasound to locate the stones. Stone elimination was evaluated by ultrasound at one, three, six, and 12 months post-lithotripsy and annually thereafter. Data are currently available for 70 patients, nearly three-quarters of whom are female. The average age was 53 years, 74% of stones were radiolucent, 60% of patients had only one stone. Results obtained after the first session were as follows: 77% of patients had fragmented stones, and in 23% there was no fragmentation. After the last session of lithotripsy, 81% of patients had fragmented stones, and only 19% of patients showed no fragmentation. In 35% of patients who had fragmentation, the fragment size could not be measured; two of these patients had no stones remaining. Eventually 14 patients underwent a cholecystectomy with no lesion visible at operation. Of these 14 patients, (20% of the total), eight had radiolucent stones and six had calcified stones. From this study it may be concluded that surgery will be required in at least 20% of patients; medical therapy will be indicated in 50% of patients, and the remaining 30% of patients will not require any further therapy.